The model is praised for its front crash prevention system. The 2016 Mercedes-Benz C-Class is joining the Chrysler Pacifica, Honda Civic, Chevrolet Volt, Audi A4, BMW X1, and more in getting a Top Safety Pick+ award from the Insurance Institute for Highway Safety. The German premium midsize vehicle receives good ratings in all five of the IIHS crashworthiness evaluations — small overlap front, moderate overlap front, side, roof strength, and head restraints. The model is praised for its front crash prevention system, which comes as standard on all trim levels. An additional, optional system boosts the car’s front crash prevention rating to superior. 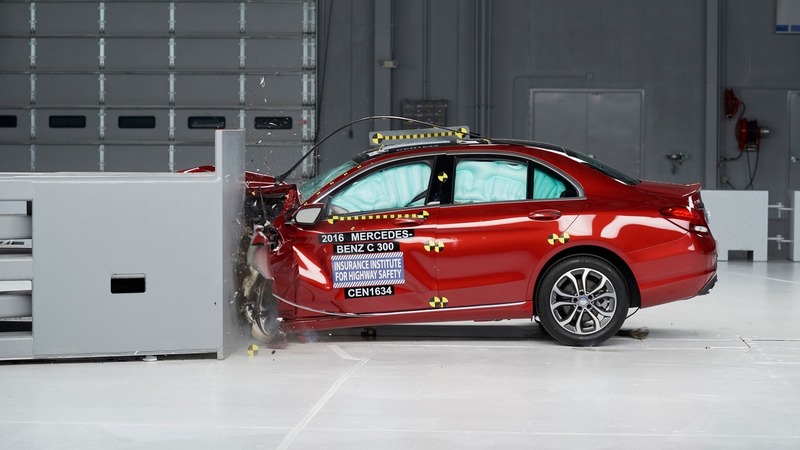 The Institute points out there is a big improvement in the challenging small overlap test over the previous generations C-Class, as the new vehicle’s structure held up well with maximum intrusion into the occupant compartment of four inches against 20 inches for the previous model. The new C-Class also shows very good results in the roof strength test, showing a strength-to-weight ratio of seven, among the highest ever registered. IIHS explains a ratio of four or higher is required for a good rating. Interestingly, the car earns unexpectedly low ratings in the headlights category with the overall quality of the illuminators rated as poor. IIHS says on the straightaway at low beams, visibility is “inadequate on both sides of the road,” while on curves, “visibility was inadequate in all four tests.” The Institute tested vehicles with classic halogen reflectors and with LED projectors. Earlier this year IIHS conducted its first-ever headlights test only to discover many modern premium vehicles have poor headlights. For example, the BMW 3 Series has the worst halogen headlights in its segment, according to the test, but the optional LED headlights significantly improve the situation. IIHS says headlights are a major factor for safer roads, as nearly half of all traffic deaths occur at night or in low light situations such as dawn or dusk. he 2016 Mercedes-Benz C-Class is the latest winner of the Insurance Institute for Highway Safety's TOP SAFETY PICK+ award. The midsize luxury car earns good ratings in all five of the Institute's crashworthiness evaluations — small overlap front, moderate overlap front, side, roof strength and head restraints. It also has a standard front crash prevention system that earns an advanced rating. An additional, optional system boosts the car's front crash prevention rating to superior. 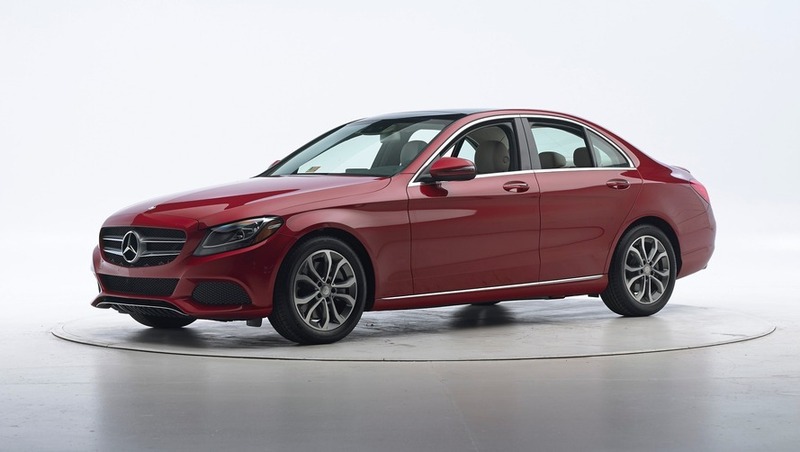 Although the C-Class was redesigned for 2015, IIHS only recently evaluated it for crashworthiness. In the challenging small overlap test, the car's structure held up well with maximum intrusion into the occupant compartment of 4 inches. That was a big improvement over the earlier generation of the C-Class, which had intrusion of 20 inches at the footrest and earned a marginal rating. Also notable are the results of the roof strength test. 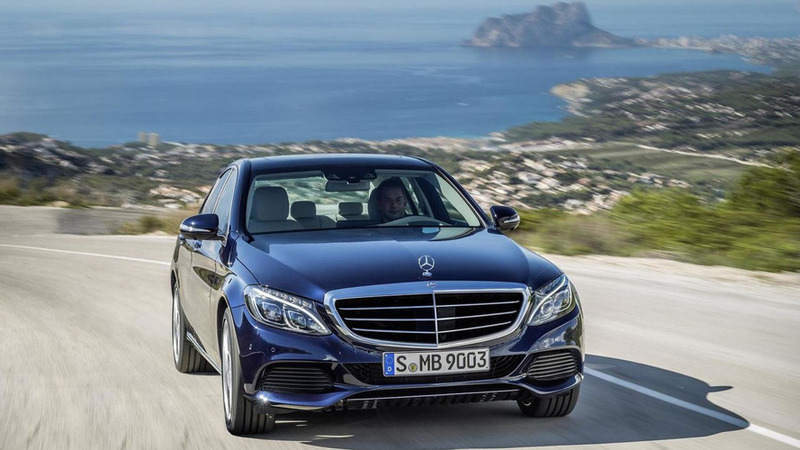 The C-Class was found to have a strength-to-weight ratio of 7, among the highest ever registered. A ratio of 4 or higher is required for a good rating. Roof strength is important for protection in a rollover crash. 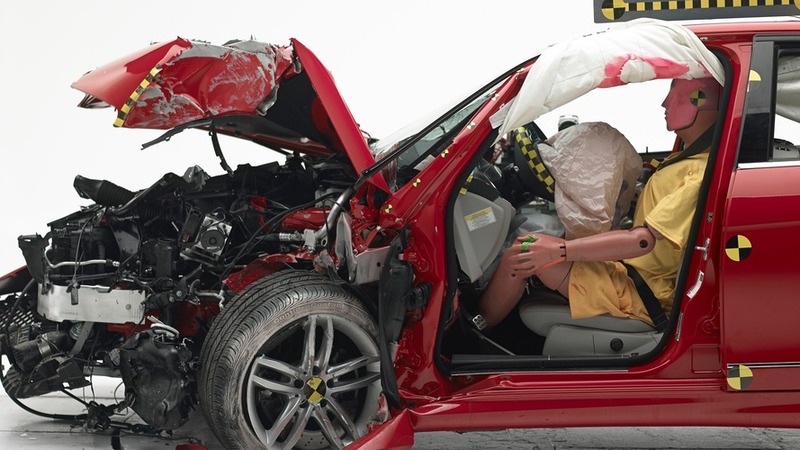 To qualify for 2016 TOP SAFETY PICK+, a vehicle must earn good ratings in the five IIHS crashworthiness tests and an advanced or superior rating for front crash prevention.